are beautifully lit up with the luminaries of the 'festival of lights'- Diwali. unable to share with you a few pages from the book . drive home the message that healthy meals don't have to be boring. Telegraph bookshop etc. and also at selected stores worldwide.
' Fun Food for Fussy Little Eaters ' . fun foods or anything about your creative foods /creativity. 2. Sharing the giveaway on your blog, Facebook or twitter . Post by Little Food Junction. I am not on facebook, but leaving a comment here just to let you know that you have a fan now :) W.O.W...seriously wow at your creativity! Making food appear fun is a great way to interest kids in not just eating what's on their plate, but also in what goes on in the kitchen. As they grow older, they'll want to make their own creations and develop their own imagination :-). Food for little ones can be a tedious job. Cooking seperately with less spices , less oil and still make it "fun" is where the real challenge is. I almost panick when I have to organise a bday party or a try and feed him something that is healthy and well not "potatoes" and "Choco pie". So for me this is a great idea and I wish to learn these amazing techniques of making fun food for my little ones and ensure that he gets a proper nutritous and a balance diet. Now thenext question, when ?? Well atleast the weekends if I can as i will have more time at my disposal. And if possible something easy and quick fix kind of solution when we are travelling with the kid. Was never a food enthusiast became one when unlike other moms who have fussy eater I have a kid who loves food and at just 4 she watches cookery shows with interest , talks about textures and graininess. would love to gift her this book and then take orders for the special meals. Just love your ideas! You've inspired me, I sometimes make fun foods for my 3 year old, but need to do it more often,its so cute! 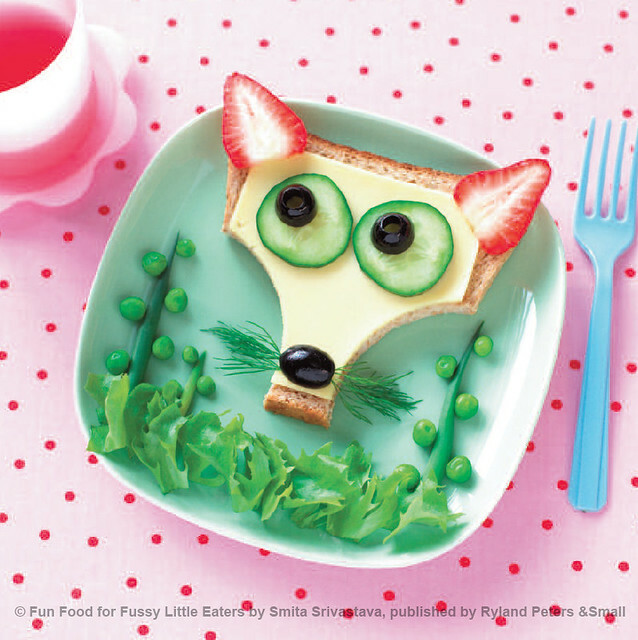 Awesome recepies with great artwork to create fun food, keep it up ! I love making cute foods for my boys on weekends & holidays. I love the way you play with foods and create beautiful arts through them..Seriously i just love your creativitiy. Your creativity is awesome. I can't imagine. Especially kids need the shapes. fantastic idea. I like your creativity. Beautiful creativity. Especially my kids are very picky eaters, I luv to share your creativity. such a beautiful presentation too. I luv it. This looks so unique and different. I would love to go through the book, review it on my blog, my first love. Though I am not a great cook but I love decorating things and art and craft attracts me a lot. Playing with food designs is something I look forward to to involve good eating habits among children.. The look absolutely matters!!! Must say again Great work!! En verdad tu IMAGINACIÓN Y CREATIVIDAD NO TIENE LÍMITES!!! I like making fun food because it amuses me, and my kids think its fun. Cooking & baking have always relaxed me, and this is just an add-on to that. The book looks great! Congratulations on the book. I think it sounds like awesome fun. I'm not a very enthusiastic daily cook, but I do love having fun once in a while. I don't make an effort on a daily basis because I honestly believe kids should learn the importance of healthy food going into their bodies instead of having to be coerced into eating it. What I love though, is going all out on an occasion such as a festival or a birthday. I don't know if you allow links within comments, but here are two occasions on which I had fun with the kids' birthday party menus. Congrats Smita !! VERY PROUD OF YOU.!! Our best wishes to you & hope to see many more success in your life. I love making creative food and do it practically every day for my blog. Congrats on your book. I can't wait to see all your amazing projects inside! Cute foods are my weakness ....Have liked you on facebook . Always have loved your beautiful ideas. I know how difficult it is to feed young kids, now with this beautiful book of yours feeding young kids won't be a struggle for Moms... How I wish I had come across something like this when my kids were growing up. Love all your creations! Following you since 2-3yrs now. I have 5 fussy kids around me (nieces & nephews), who I baby-sit so often and really Need Help! Your book is perfect for me! Absolutely fabulous food/photography blog and creations! If I win, it's an inspiration for me to put more effort on my boy's plate of food. Thanks for providing me the opportunity to join this giveaway. Came over from ArtsyCrafty's blog..didn't want to miss this wonderful book..I'm sure it is a must have for all the Terrible-Two year moms. Happy Diwali! I am bento mummies who love most bentoes and I really can feel and see your EFFORT in it. Great work! Keep it! Thanks for the giveaway and the oppourtunity to win.Congrats! for your new book.Love all your creations.You inspire me to recreate them for kids and parties.Already a fb fan.Keep creating.Keep sharing. I plan children's birthday parties and would just LOVE this book! I'm heading over to facebook to 'like' your page now. Wow what creativity! Having little fussy eaters at home, I have to make fun foods to keep them interested and your book seems like a treasure trove of creative ideas. Good luck! I cannot describe how delighted I was when I saw the cover of your book for the first time. With the perusal of each page my smile grew wider and wider and I began to experience pure joy on a visceral level. What a unique and wonderful idea. It reminded me of one of my own projects when I was taking a Holistic Nutrition course. I had to present information about the food sources of magnesium and the way I chose to do it was to make a little person out of the food sources. Her name was Magi and she had a banana body, asparagus arms, an apple head with a collard cap, multigrain cheerio eyes etc etc..It was a huge hit and I got top marks. A picture is worth a thousand words, which is so true ,and if we look at something that makes us feel good, then it is natural to want to bring that into our lives, and into our bodies in the case of food. There is no question that the consumption of fruits and vegetables is a major contributor to excellent health, and the food items in your book feature these items dominantly. I am truly inspired to share and provide these treasures to all the people who I hold near and dear. I do not have children however I do have some aquaintances who are Seniors and they can be "particular' as well as kids. I look forward to seeing a smile light up their faces. A big thank you to you, Smita. Oh my gosh - I love these! The fox is incredible!